﻿ How Do Hearing Aids Work or Is it Magic? How Do Hearing Aids Work or Is it Magic? Understanding how hearing aids work can help you experience your world in full color. Although they may seem like magical devices, hearing aids work by picking up all of the sounds around you and amplifying those sound signals back into your ear. The magic of hearing aids happen instantaneously to provide you with a miraculous 360 degree listening experience customized just for you. Continue reading to learn how do hearing aids work and a few of the most important components. Analogue hearing aids are the older model and are not as widely circulated today. These devices pick up different sound signals and translate them into an electrical signal. This electrical signal is amplified and then fed back into your ears. Some of the more advanced analogue hearing aids are able to determine whether sounds are quiet or loud, so they can discriminate whether certain sounds should be amplified. For instance, these hearing aids may be able to recognize louder sounds like traffic, which may not need additional amplification. This innovative feature on analogue hearing aids is known as "automatic gain control." The more modern hearing aids are digital hearing aids. 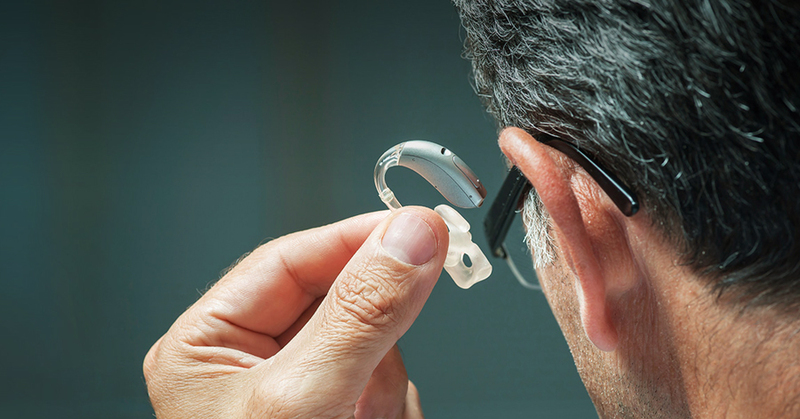 These hearing aids are engineered on more cutting-edge smart technology and scientific knowledge than analogue aids. Digital hearing aids include a silicon chip made up of millions of electrical components working to continually process incoming sounds. Once processed, these sounds are transformed into more audible clearer sounds. Finally, these clearer sounds are released into the ear at the appropriate level, so you can hear and understand them. The innovative technology in digital hearing aids allow the devices to easily distinguish sounds to determine which ones should be amplified. At the same time, these hearing aids can determine unwanted noises and effectively reduce them. Being able to differentiate between desirable sounds and background clutter allows digital hearing aids to amplify speech sounds more clearly. Eliminate feedback and whistling while on the phone and hugging someone. What Are the Parts of a Hearing Aid? Microphone. The hearing aid mic is engineered to pick up sounds waves and convert them into digital signals. The microphone is located on the outside of the hearing aids. Microchips. The miniature computer customized by your local audiologist is called a microchip.The microchip is the innovation inside of digital hearing aids that allow them to seamlessly connect you to world around you in HD color. Amplifier. The amplifier receives the digital signals from the microphone and amplifies them into more audible sounds. Receiver. The receiver is the speaker that actively converts digital signals back into sound vibrations. Those vibrations are then passed through the inner ear into the brain where it's interpreted as amplified sounds. Battery. All hearing aids will have a tiny battery that powers the device. Behind-the-Ear Hearing Aids offer a slim-line and discreet design that sits comfortably behind your ear. In-the-Ear Hearing Aids are discreet and completely customizable to help amplify your unique hearing needs. Invisible Hearing Aids are designed to be virtually unseen and fit discreetly behind your ear. Bluetooth Hearing Aids offer the ability to make calls wirelessly from your mobile device and even stream music. Contact North Shore Hearing P.C. Contact North Shore Hearing P.C. today for a complete audiological solutions.